Obama on "Meet the Press" Sunday. Will Climate Change Come Up? Barack Obama will be live on NBC's Meet the Press Sunday for a full hour. Will climate change come up? Or will Tim Russert focus on Wright, Bosnia, and who's bitter? Who's bitter? Us after watching journalists ignore critical issues and waste our time on meaningless "gotchas." Please tell Tim Russert you'd like him to ask Barack Obama about his plan to confront climate change. Another possible question - why isn't Sen. Obama joining the panderers (yes, you, Hillary and McCain) who want to cut the gas tax to score political points? I never got within three blocks of Arlington E-CARE. Traffic was backed up down 2nd Street South, out to Glebe Road, and all the way up to the north side of Route 50. It took me 10 minutes just to turn around and get out of the backup. The District's spring Household Hazardous Waste and E-Cycling collection turned 16th Street NW into a parking lot most of yesterday. Cars were idling for hours as people waited to drop off paint, solvents, batteries and old electronic goods at the Carter Barron Amphitheatre parking lot. Some people eventually ditched their cars and carried cans of paint, gasoline, even TVs, walking for blocks to the site, part of Rock Creek Park, where they still faced long waits. One put a 26-inch television into a baby stroller and wheeled it in. And some just gave up. The inconvenient truth: The D.C. government wasn't prepared for the demand to get rid of junk in an environmentally safe way. With people more aware of the need to save the planet, having a twice-a-year drop-off day no longer cuts it. Fortunately, Arlington is way ahead of DC. We already have a Household HazMat Program that allows residents to drop off materials Saturdays from 9am-3pm. When I abandoned E-CARE, I just kept my old anti-freeze and electronics in my car and headed to Fern & South Glebe (near Potomac Yards Mall) the following Saturday. At first when I drove onto the lot, I was confused about where to go. Turns out I'd blown right past the security guard, an older man who was just shuffling out of the booth as I circled back. He meticulously recorded my name and license plate number, then I turned to leave. I said, "Where do I go now?" He turned back and, without saying a word, slowly and dramatically raised his pen in the direction of the drop-off site. High comedy. The drop-off site was doing a brisk business and there were a few other cars unloading as I pulled up. I hauled my old PlayStation 2 out of my trunk and an attendant excitedly said, "Oh, great! We have a guy who fixes those and gives them to kids." Hopefully DC will follow Arlington's lead and introduce a similar drop-off program. Really, what have they been waiting for? I guess sometimes it takes a train-wreck like Saturday's to demonstrate how woefully inadequate something is. Starbucks Introduces Their "Boldest Organic Coffee"
Quick post today. I was in Starbucks the other day and was excited to see they've introduced Organic Sumatra-Peru Blend. They're calling it their "boldest organic coffee." Sumatra is my favorite Starbucks blend so downright giddy about the potential of an organic version. I've been going with the Organic Coffee Company's Java Love, which I can usually get on sale at Harris Teeter (translation: much cheaper than the $13.49 price tag for the Starbucks Organic Sumatra-Peru, not available at The Teet), but Starbucks may convert me. Will the organic Sumatra hold up to its standard counterpart? I'll let you know. The Pennsylvania presidential primary has come and gone, and still the media refuses to talk about global warming. STEPHANOPOULOS: How about on the issue of climate change? Because you and Sen. [Joe] Lieberman [I-Conn.] have come out for a bill which would have mandatory reductions in greenhouse gases. MCCAIN: What I mean by that is that it's cap-and-trade, that there will be incentives for people to reduce greenhouse gas emissions. It's a free-market approach. The Europeans are using it now. We did it in the case of addressing acid rain -- look, if we do that, we stimulate green technologies. I have great faith in the American industry. General Electric, the world's largest corporation, has announced they're dedicated to green technologies. This will be profit-making business. It won't cost the American taxpayer. It will make profits, because we'll move forward with the innovation and ability of American industry to address this issue. But now McCain has changed his position. He says he'll only support the Lieberman-Warner Climate Security Act if massive new subsidies for nuclear power are added. If he sticks by that position, he might as well oppose the bill entirely, because if costly nuclear subsidies are added, many Democrats will vote against the legislation. So McCain is trying to take credit for supporting climate action, but only with amendments that would be fatal to its passage. Sounds like a prime opportunity for a "gotcha," right? Nope. McCain was on This Week again on April 20th and climate change didn't even come up. 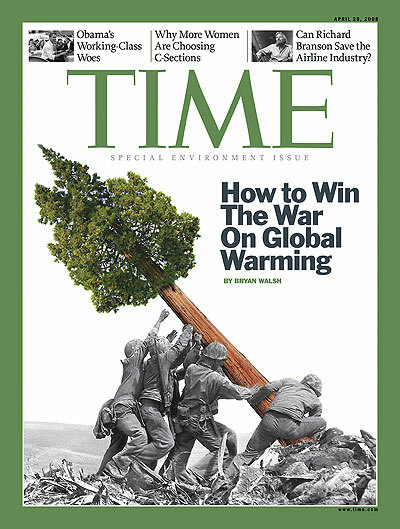 Time magazine has a more comprehensive look at the politics of climate legislation. When it comes to candidates and climate change, talking the talk matters almost as much as walking the walk. Because if candidates don't bring it up, the media won't do it for them. That's why it was so refreshing to hear Arlington School Board candidate Karla Hagan bring up the environment at last week's school board debate in her opening statement. Sure, a cynic might say it's not like being green a risky move in Arlington, home to more bleeding hearts per capita than any community south of Cambridge. But none of the other candidates mentioned the environment even once. Given Arlington's environmental leadership on programs like Fresh AIRE, you'd think schools would be out front on environmental issues. But I've heard many complaints from students and parents that schools didn't even recycle, though that's slowly changing. Meeting our Earth's environmental challenges will be one of the most critical milestones for our children's generation, and yet I am the only candidate talking about this issue. While we are doing some things right, our school system has no defined environmental curriculum or policy guidelines. I will provide the much-needed leadership to ensure that Arlington Public Schools joins Arlington County - a national leader - in its environmentally progressive policy. Schools are a civic entity that must contribute to environmental advances -- and in schools, there's an important additional component: we must teach our children by our example. Environmentally responsible education is a part of my passion for ensuring our young people are ready for their future with an education suited for the 21st century. We must focus not just on content but also on skills that will prepare our children to solve the big environmental, energy, medical, and societal challenges they will face: skills that are so valued in the workplace, such as creativity, innovation, collaboration, and effective communication. Though full of challenges, their future will be very exciting, and I want them to be ready for it! School Board members like Libby Garvey have pushed for more sustainability in schools, making Langston Brown and the new Washington-Lee LEED-certified green buildings. And I certainly understand that in tight budget times, it's harder to justify increased initial investments in efficiency that bring long-term budget savings. But a driven environmentalist like Hagan could push the board to do even more, taking advantage of the boundless environmental energy of Arlington students. As a teacher friend once told me, the best way to change the behavior of parents is to send a note home with their student. There are six well-qualified candidates running for school board, including Garvey, a longtime friend of the environment. Hagan's willingness to step out on environmental issues certainly raises her profile in a crowded field. A female audience member ran on stage last night and threw a green pie at New York Times columnist Thomas Friedman, who had just begun a lecture on environmentalism in Salomon 101. The woman had been sitting in the south side of the auditorium's front row when she pulled the pie out of a Brown Bookstore plastic bag that had been tucked in a red backpack and leapt out of her seat. The pamphlets thrown by the male accomplice identified the pair as the "Greenwash Guerillas," who wrote that they were acting "on behalf of the earth (sic) and all true environmentalists." I haven't seen such a classy move since Deion Sanders threw water on Tim McCarver not once, not twice, but three times after the 1992 National League Championship Series. Environmentalists have spent decades earning a place at the table, honing messaging on jobs, quality of life and preserving America's natural resources. The environmental movement will reach a high water mark this June as the Senate considers the Lieberman-Warner Climate Security Act. We may argue about the details of the bill, but facing the biggest environmental crisis of our generation, environmentalists have brought a strong solution to the brink of passage. Throwing pies just reinforces conservative stereotypes that environmentalists are damn dirty hippies who would rather be on the fringe of society and don't deserve to be taken seriously. But I'm impressed at the comments at the youth climate movement blog It's Getting Hot In Here, which have been overwhelmingly against the "Greenwash Guerillas." As the Brown Daily Herald editorializes today, "A pie in the face is memorable, but given its inappropriate and insulting nature, this kind of publicity stunt will only hamper future attempts to discuss the issues that brought it about." When it comes to flooding, the Hampton Roads area is already the second-most-vulnerable area in the country behind New Orleans. So what happens when sea levels rise about two feet (the conservative projection) over the next century due to global warming? With a mouse-click, Lockheed Martin analyst Chris Mang showed the impact of a routine winter nor'easter striking on top of the higher water level. Large parts of the city went underwater, much as they did during Hurricane Isabel in 2003. "In a hundred years, even your average storm becomes a real problem," Mang said. And a hurricane with Isabel's punch would cause far more damage than Isabel did. Mang detailed the disturbing projections at yesterday's Virginia Commission on Climate Change meeting in Williamsburg. Keith McCoy, a spokesman for the National Association of Manufacturers, said a patchwork of carbon dioxide emission limits by states would create confusion and possibly prompt industries to move to less restrictive states, with no net loss in emissions. McCoy said polls suggest that while people want to reduce greenhouse gases, "they don't want to give up their SUVs, and they don't want to turn down their thermostats." One commission member called McCoy "plain wrong." You can view the slides of all of the presentations at the commission's website. I got nothin'. I blog about the environment 365 days a year. Why make a big deal out of one? Does that mean everyone can ignore the Earth the other 364? OK, I do have one little thing. Have you seen the cover of TIME magazine's environment issue? Doesn't it look like they're putting up one of those cell phone towers made up to look like a tree? Wouldn't it have fit the image much better and been more 21st-century to have them putting up a wind power generator? And for the most creative skewering of President Bush's inaction on global warming I've ever seen, you have to read The Fat Bush Theory. UPDATE 1:53PM: Even more annoying than declarations that Earth Day will save the planet -- pretentious declarations that Earth Day was like SOOO much better back in the day, and now it's all ruined and commercialized. What amazes me most is that while a gym membership can run you $1,000 a year, the park, much like J-Lo's love, don't cost a thang. Tomorrow from 8:30am-3pm at Thomas Jefferson Middle School, Arlington County will be hosting its spring E-CARE! The Arlington Environmental Collection and Recycling Event gives you a chance to recycle items not picked up curbside or at county recycling centers. E-CARE gives you a chance to safely dispose of potentially hazardous items like CFLs, car fluids and electronics. The Green Miles plans to drop off some old anti-freeze and a PlayStation 2 that kicked the bucket a couple of years back. It's also a rare chance to recycle items like shoes, eyeglasses and bikes that may not be of use to you anymore, but could find a second life in a developing country. Come to think of it, it may be time to recycle my embarrassingly huge, not in style now, not in style then, not in style ever high school glasses. Check out the E-CARE website for a full list of what you can drop off and handling instructions. My favorite line: "Smoking is not allowed at the drop-off site." I couldn't help but be reminded of the chemical toilet from National Lampoon's Christmas Vacation (sorta NSFW). I've already blogged about how the new Nationals Park is a green diamond. When I made my first visit last weekend, what I noticed most was how much of an impact the new stadium's green features had on the fan experience. The green roof, the water filtration system, the drink cups made from corn ... as a fan, I would never have guessed I was in a LEED-certified building. But one burning question remained. What about the beer? Last spring, I blogged about how the Washington Nationals struck out my beer craving at RFK Stadium, offering warm beer that was hard to buy in a wasteful process. That monolith is a refrigerator, a quantum leap over RFK's comically deficient ice chests. My beer was almost too cold. I did not complain. Aluminum on one side, plastic on the other. Heartwarming. Of course, beyond the bin, there's another huge environmental challenge - the polluted Anacostia River. Think someday we'll have a river walk with bars and restaurants overlooking a clean waterway? A federal health agency acknowledged for the first time yesterday concerns that a chemical found in thousands of everyday products such as baby bottles and compact discs may cause cancer and other serious disorders. 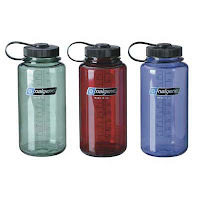 I get questions from people all the time about the safety of drinking water from Nalgene bottles made with BPA. Fortunately, Nalgene now offers BPA-free bottles. For parents, a company called Born Free makes BPA-free baby bottles. I'd imagine "BPA free" stickers on plastic products are going to become more and more prevalent after this report. It's April, home of Earth Day, which means every magazine known to man is putting out a "green" issue. Many are genuine efforts to educate their audience, which might not necessarily be plugged in to environmental concerns. Other magazines simply greenwash, slapping a pretty nature picture on the cover because they know it'll sell more copies at newsstands. 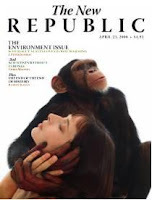 The New Republic's environment issue arrived in my mailbox last week and it's hard to fit it into either the "genuine" or "greenwashing" category. The content is solid, particularly Chris Mooney's Hard Science: Labratory geeks need to toughen up. But environmental content only fills about 11 of the magazine's 56 pages. By page count alone, it could just as easily be the Russia issue - articles about or related to Russia fill up about the same number of pages. A much more promising development from The New Republic is their new Environment & Energy blog. Despite a brief controversy about sponsorship, the content has been solid and it's been a daily must-read for The Green Miles since discovering it last week (ironically enough, due to that very controversy). Celebrate how campuses nationwide are solving global warming and join us for the 2nd annual Chill Out: Campus Solutions to Global Warming broadcast! Be part of the LIVE STUDIO AUDIENCE at George Washington University's Jack Morton Auditorium on April 16 at 6:30pm eastern. The program will be broadcast live to colleges nationwide beginning at 7pm. Kick-off Earth Day with this special event! Chill Out will include special appearances from Gary Hirshberg of Stonyfield Farm and more! To reserve your FREE seat at the live Chill Out broadcast at George Washington University contact Kristy Jones. Saturday: Tell Gov. Kaine No New Coal! Many of you have spent a lot of your time over the last few months fighting Dominion Power's controversial coal plant proposal for Wise County -- from gathering petition signatures to giving testimony for the SCC, you have done it all. The grassroots response to the notion that Virginians should pay $1.8 billion for 5.3 million tons of CO2, 49 pounds of mercury and more mountaintop removal coal mining has overwhelmed nearly everyone in this state, except for Governor Kaine. The Governor still staunchly supports the Wise County Coal plant, and this Saturday at 1pm you have a chance to ask him why at a town hall meeting in Falls Church. Join dozens this Saturday to give the Governor a piece of your mind. Virginians want clean energy, not new coal! If you can make this event, please go and tell Gov. Kaine to reject new coal plants and instead invest in a clean energy future! I was in Harris Teeter the other day and noticed this - a solar-powered tiki torch! Very cool idea. No need to worry about kerosene or batteries (both negatives for the environment) and different brands claim to last anywhere from 6-10 hours on a single charge. The solar-powered tiki torches at Harris Teeter were selling for a ridiculous $100. Believe it or not, that was a mark down - they were originally listed at $150. Fortunately, Amazon.com has several brands available, none for more than $30. Some even claim to be solar-powered tiki torches/bug zappers. The customer reviews on Amazon.com seem to indicate that while the lighting is surprisingly good, the poles they come on are flimsy. Anyone ever used a solar-powered tiki torch? Looks like the red-tailed hawk that dive-bombed a teenager named A-Rod at Fenway Park last week isn't giving up her home so easily. The hawk hung around the park during batting practice early this afternoon. There's video here and it certainly looks like the same bird. Big reaction from the crowd as the hawk shows up - swoops around - maybe he was wondering which one of those humans evicted him from his nest. Nice touch. Combined with the return of Bill Buckner, quite a day at Fenway! H-B Woodlawn Hosts "Trashion Show"
I stopped by H-B Woodlawn High School on Friday night for an eco-friendly fashion show! Organized by Arlingtonians for a Clean Environment student board member Leslie Keller, the "Trashion Show" featured clothes made out of reused material like newspapers, plastic bags, and even invasive plants like English ivy. The Green Miles and Arlington County Clerk of the Court Paul Ferguson were asked to say a few words to open the event. There is absolutely no tougher audience than high school students. Not because of them - any kid who'd come back to school at 7:30pm on a Friday night has to be dedicated to the cause and they were a gracious audience. Because teenagers have the most receptive BS detectors of anyone, I knew I had to watch myself. Even the slightest hint of hypocrisy and I'd be dismissed as a phony. I think I held my own. The show itself went great, with proceeds going to the H-B Environmental Club. Congrats to H-B, the designers and models, and especially to Leslie! I have a feeling we're going to set a record today for "most times my friends email me a story." Red-tailed hawk, Fenway Park ... if only there was organic beer involved, it would be the perfect The Green Miles story. So there's this red-tailed hawk that's been coming to Boston's Fenway Park for years now. One would think an empty ballpark would seem like great habitat to a hawk - high rafters to nest in, lots of pigeons and sparrows for easy prey. They've usually been able to shoo her away before it nests, but this year she and her mate managed to build a nest near the press box above home plate. Unfortunately, the egg rolled out of the nest and is no longer viable. But the hawk doesn't know that, so she's still protecting her roost. And when a tour group came through yesterday, the hawk dive-bombed a teenager who happened to be standing nearby. Amazingly, a Boston Globe photographer happened to be there and captured the whole thing. The girl only got a small scratch and wildlife officials removed the nest. Could it be an omen for Yankee Alex Rodriguez, who once got a catcher's mitt shoved in his face during a scuffle with Red Sox catcher Jason Varitek at Fenway in 2004? "I deal in science, not mythology," [assistant director of Fisheries and Wildlife Tom] French said, refusing to make any baseball predictions based on the feisty hawk. "Although you could say she has done a good job protecting her home plate." In hindsight, the hawk should've been moved sooner, but I don't think it was the worst outcome of the situation. If the hawk was this unsettled by one tour group, what would her reaction have been when 39,000 people filled the place Tuesday afternoon for the home opener? The Green Miles hit 30,000 visitors this week. Thanks for reading! UPDATE: Just for fun, here's my most viewed page of the last year. Also included in the list - leading global warming denier Sen. James Inhofe (R-OK), President Bush, and Vice President Cheney. As Austin Powers would say ... ouch, baby. Very ouch. But if anything, the write-up itself is kind to Gov. Kaine. His Virginia Energy Plan doesn't cut greenhouse gas emissions 30% from current levels by 2025. It's a 30% cut from the projected rate of growth by 2025, which only works out to about a 7% cut from current levels. How could Gov. Kaine turn his image around? Easy. Stop cheerleading for new coal power plants. Invest in energy efficiency and conservation to save Virginia taxpayers and businesses millions of dollars in energy costs. Create new jobs by promoting clean energy sources like solar, wind and tidal power. In fact, the poll right now on the eponymous Raising Kaine blog asks whether Gov. Kaine should stop supporting the proposed coal-fired power plant in Wise County. Vote now and tell Gov. Kaine to choose clean energy over coal!